I am in the market for a Cobra. My first choice is the ERA. 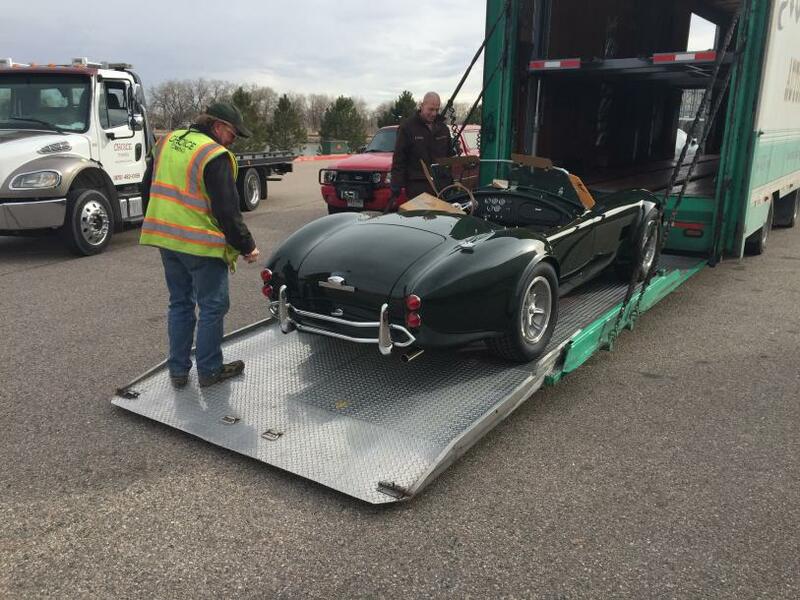 Are there any ERA 427 Cobras in the northern Colorado area that the owner would be willing to show my his car and talk about his experiences building, registering and owning the car? Thanks. Try going to the Cars and Coffee. I think it's the first Saturday so that would be coming up. It's at Arapahoe Road and 95th st. If you want to avoid the hassle of building, guessing, redoing and registration you can buy a used one. I have a lovely 427 ERA for sale. Save lots of money and time over new, too. I saw your car in 427 CobraCountry. It is a very nice car and fairly priced but I am looking for a car without racing stripes, side exhaust, roll bar and hood scoop. A street car. Unbelieveably great price for a beautiful sorted 427 ERA Cobra. Order one new today and it will take you over a year to get it and cost close to 100k unless you build it all yourself (another two years). Remove the roll bar and reroute the exhaust pipes...maybe even repaint it your color and you still save big bucks. "Paint It Black, Black As Night"
I don't blame you - street cars are very nice. They are very difficult to find on the used market. There was one on Cobra Country this winter, but it was $79K I believe. It also had a hood scoop (blue car). I've been looking for a Street 427 ERA for 2 years and finally found one - my birthday present to myself last week. I had considered converting my red car to street car (interior is already there as it's a street dash and such). I also have the lower exhaust cutout pieces from another car that could be worked in with some additional body work to cover the exhaust holes. Roll bar holes can be dealt with at the same time and then paint same color or color of your choice. ERA will sell you a new hood for about 600 and the under car exhaust is about 900 including headers last time I checked. The dual carb setup will clear the hood without a scoop. The paint on my car is just way too nice, that I couldn't bring myself to do it. Still, it's worth considering paying only around $1500 for parts plus body work and paint to get exactly what you want and still save money and time. Last edited by 66gtk; 06-02-2016 at 07:12 PM.. I appreciate the comments. I was thinking about converting one to a street car and was going to post a question about what it would take to convert a car. You have answered that, thanks. I may rethink this and go the conversion route but I am in no hurry. I just retired after working for the last 40 some years and am still trying to figure out this retirement life style. I've been looking for a Street 427 ERA for 2 years and finally found one - my birthday present to myself last week. The dual carb setup will clear the hood without a scoop. Alright Troy - don't keep us in suspense. What did you find? It has to be a low riser intake to clear the flat hood - either single or dual carb. Bob P. once posted a shot up an ERA hood scoop with a medium riser dual quad intake in response to a question about this, and it was full of air cleaner. I'm not aware of a reproduced dual quad LR intake but there are used ones out there - typically 63 and 64 production. Congratulations on retirement. I got a paper that said I was 6 years ago but they keep dragging me back part time and I haven't completely managed to break the last links. I guess I'm a failure at retirement. Like so many things, what it takes to convert to a fairly authentic appearing street car is a matter of how far you want to take things. It's both complicated and simplified by their being a few different models of 427 street roadsters - mostly variances in the engine and in the rear fender flare. The earliest street cars used basically a fully flared rear fender that was not a lot different from SC cars I believe. Then Shelby had them narrowed to better fit the width of the standard 7-1/2 inch wide Sunburst wheels and tires that were installed on all 4 corners - these are called the narrow hip cars. These are not commonly replicated although I think Kirkham does. A Cobra painter - Metalporphous converted an ERA to a narrow hip 427 car a couple years ago and made molds of the fenders for duplication. After awhile, Shelby reverted back to the wide hip fenders for the remainder of the street roadster run. Even in the wide hip cars there were some subtle changes in wheel lip flare and taper in at the front down to the rocker. There were also some minor changes in the rear flare of the front wheel wells. AC bodies were typical of many English roadsters of the era in having a curved rocker panel profile - or exhibiting a slight belly. It's not apparent on SC cars because of the exhaust and usually no one tries to replicate it (except Kirkham). It is visible on a Street Roadster but very few you will find attempt to replicate it. Metalmorphous did so on the ERA they converted to a narrow hip car. I did so to some degree on my car when I built it although I probably don't have as much belly in it as the originals. This is one of those almost off the deep-in details that you have to think about how far you want to go. The scoopless hood, lack of roll bar and undercar exhaust have been covered. The street cars had a different dash instrument layout and a glove box. The seats were leather where the SC cars were vinyl. The street cars had a different gas cap - basically a BSA motorcycle cap that sat flush on the fender instead of being partly recessed. They used chrome over-riders and usually chrome hoops for bumpers. The earliest cars used rectangular tail lights and the later ones had the round - quad tail lights. Then starting to work further down into the minute details they had a vinyl pocket across the rear bulkhead of the cockpit for storing the side curtains. The rear bulkhead was vinyl covered. Everything else was carpeted. As far as I know Smith gages were used on all 427 Street Roadsters. If any SW gages were used I'm guessing it was on a few very early cars. Some cars had the reverse wind 180 mph speedometer but some had a regular wind speedometer also - I think also a 180 mph unit. The was a unique finger grab knob for the glove box that can still be found. Some very late street cars did not have the oil cooler scoop under the front - but most did w/o a cooler. Most street cars had a single, 4-blade pusher fan in front of the radiator (not the twin fan set up most see). There was a unique Trico windshield washer bottle under hood. I think they used the 3 Girling fluid cans for brakes and clutch - not sure if there was variation in this or not. The 428 cars used a police interceptor intake with a Holley and were typically Ford engine blue. The 427 cars were actually mostly single four barrel Holleys - not sure what intake they used. The 427 motors were typically painted black. I may be mistaken (probably are) but the earliest street cars used what was basically a 1964 spec low riser, 427 center oiler engine - pretty much an R-code Galaxie engine and they may well have used the dual quad intake from it. And after that you can really dive off into the truly minute details - location of battery, location of voltage regulator, location of starter solenoid, Lucus components for underhood wiring, straight slot mounting screws, etc, etc. One thing seems to hold - there were exceptions to just about everything, Cobra's being essentially hand assembled cars and parts being constantly sourced by Shelby or supplied by Ford and being somewhat variable. And then Day 2 changes were probably so frequent that a 6 - month old Street Roadster could have any number of changes made to it already - so what's original and what's custom? Few are schooled enough in the cars to know (many of them on this forum however). This probably confuses more than it helps. You can capture the essence of a 427 Street Roadster with about half of the above. The rest is just personal obsession. Last edited by DanEC; 06-10-2016 at 05:41 AM..
Did you get yourself a 427 ERA? I have #649, I live in Frederick CO. We should get together some tine. 6TNCRZY - I ordered it in July 2016 but still have not received it. It is in its finally stages of assembly at ERA, car #821. I would like to connect with you and look at your car. I am in Fort Collins. Last edited by Whodeeny; 10-10-2018 at 11:00 AM..
Did you get your ERA car yet? I just put a deposit on and preparing to wait patiently. Yes, received January 16th. It was 817 days from order placement to delivery. Please share some pictures of your new car! Let's get together when the weather gets a little nicer. Was the 817 days due to do anything special (such as turnkey car)? Did you delay? I am trying to get a sense of how long it will take to get a car. Where in Colorado are you? Love to see the end product. Jeez, I thought a year was bad. And that was almost 15 years ago. Attached is a photo of the car being unloaded from the transporter. I will post more later. You are welcome to come by anytime and take a peek. I am in Fort Collins, retired, so my schedule is flexible. Just send me a private email and we can arrange a time. Nothing done really very special. The rear suspension is a little bit special, the rear track is about 2 inches wider than normal to push the wheels out to better fill up the wheel wells. It is street car with all four wheels being 7 1/2" wide and carrying 245/50R15 tires. I don't think this added to the schedule though. The car was "almost" a turnkey. The two biggest tasks left for me to do were the wiring and the interior. There were a few other odds and ends left to do also. I wanted it this way because I wanted to have "some skin in the game". I did not delay the schedule. I think ERA had several cars going through their shop about that time that were turnkey or near turnkey cars.